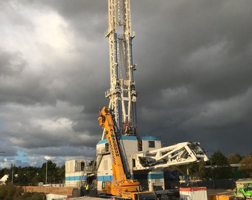 Drilling work has started at the UK’s first potential deep geothermal power plant. Two wells will be drilled 4.5km and 2.5km into granite near Redruth, Cornwall, where the temperature reaches up to 200°C.Cold water will be pumped down to the hot rocks and then brought as heated water to the surface. Steam from the heated water will drive turbines to produce electricity for up to 3,000 homes. The4.5km deep hole, is expected to take seven months to finish, and will be the deepest ever drilled in the UK. The heat-producing properties of the granite rocks under Cornwall mean the county is an obvious choice to exploit geothermal energy, said the engineers behind the project. The £18million project has received £10.6million from the European Regional Development Fund, £2.4million from Cornwall Council and £5million from private investors. Geothermal Engineering claims geothermal power could deliver up to 20% of the UK’s sustainable electricity and heat energy needs. “It is incredibly exciting to see this pioneering project getting off the ground in what we hope will be the start of many similar initiatives across the UK,” said Managing director Dr. Ryan Law.